Marney McQueen presents SUNBURNT COUNTRY starring Rosa the Russian Beautician and Friends, written by Marney McQueen and Tim Bain, at Slide, Oxford St. Darlinghurst. 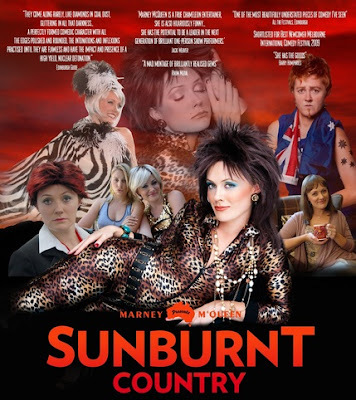 Friday night I was whisked off by Daniel Scott to see a one night stand at the Slide Cabaret venue in Oxford Street – Marney McQueen in a show called SUNBURNT COUNTRY. I had not planned it, but it was a great way to finish the week. Marney McQueen has been seen in the musical PRISCILLA, QUEEN of the DESERT and recently in HAIRSPRAY in Sydney and elsewhere. This triple threat, actor-singer-dancer has, however, not sat on her laurels there, but developed a collection of cabaret, satirical characters that take deeply humorous and sometimes penetrating bites into the country we live in. It seems Ms McQueen was inspired by Barry Humphries and there is a similar fearless razor sharp x-ray eye with the right turn of phrase and observed characteristics that could make some of us shudder. Fortunately, most of us just break out in great big guffaws. We meet Karen Barnes, a security officer who loves her frisky job. Damo, an Aussie bogan backpacker doing his duty at the dawn service for the ANZACS at Gallipoli draped in the flag and fondly remembering his storming of a beach, Cronulla. Carbon Neutral Bride Annabel Sarah Victoria Winters Smythe, a devoted greenie giving her wedding reception speech. Gold Coast cougar Raelene Dreggs raising funds for her incarcerated daughter. And, after the interval, the major persona of the night, Rosa the Russian Beautician to the stars. 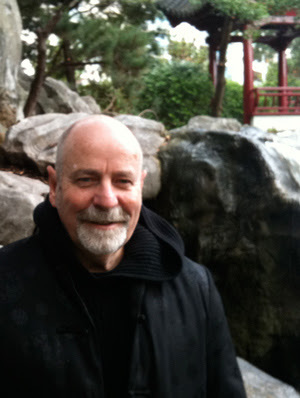 In hilarious stand-up routines that interact alarmingly well with invasions into the audience, accompanied with filmed sequences of recommendation from actual luminaries (for the Rosa beautician skills) such as Jackie Weaver, Bert Newton and Ian Healey, Ms McQueen also produces a musical theatre voice of immense range and flexibility, with a witty turn of lyric that bears a stick to the funny bone with resounding reward. On this particular night the musical accompaniment is supplied by a guest performer, the great Trevor Ashley, who subdues his own inimitable style to work as a perfect foil, stooge as Master of the Organ Sergei Longschlongadonski and others, for Ms McQueen's bravura strokes. Recently I talked of the talents of Trevor Ashley (FAT SWAN), iota, Paul Capsis, Eddie Perfect, Meow Meow and newcomer Sheridan Harbridge in the cabaret scene in Sydney and now I am adding Marney McQueen as a "watch out for her" next show (check her web site). A hit at the Edinburgh Fringe Festival and the Melbourne Comedy Festival - she is worth catching. Many thanks then to Daniel Scott then, who just happens to have his own cabaret performance on Thursday, 19th January at the same venue: SLIDE. Seems to be a happening place. Might be worth catching, too.